Tomatoville® Gardening Forums Index > What Else Do You Grow? > Miscellaneous Edibles > Tomatillos > What variety of Tomatillo do you prefer? 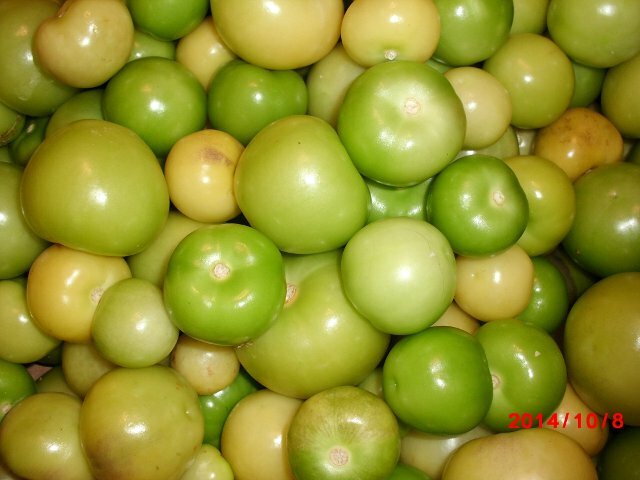 What variety of Tomatillo do you prefer? I found a Tomatillo called Grande Rio Verde on Ebay,but I haven't read too much about that one,so if anyone has info,I would appreciate hearing about it. Has anyone tried the Purple de Milpa tomatillo?Supposedly,this one is quite a good tasting Tomatillo.The description indicates it is small to medium in size.Is this one that would be worth growing for flavor even tho it might be on the smaller side? Would most people grow more than 1 variety,or would 1 be enough? Last edited by Tropicalgrower; April 23, 2016 at 10:51 PM. I grew Purple de Milpa many years ago. As I recall, it was strong flavored, and had small tomatillos just over 1" wide... but a lot of them. For the last two years, I've grown John Wyche, an heirloom from Seed Savers Exchange. It came up as volunteers in 2015, and did better than when I started it as transplants! Fruit size was variable between different plants, with some about the size of Purple de Milpa (and showing a little purple coloration), to flattened dark green fruits about 2" wide. I may continue to select for larger fruit, but the plants with smaller fruit were actually the most productive. If you are looking for larger-fruited varieties, you might want to try Adaptive Seeds. They carry a small-fruited purple race similar to Purple de Milpa, Cisinerors, and an even larger-fruited variety (Plaza Latina Giant) from Mexico. Tomatillos all taste the same to me. So, I don't have a preference. But, the larger ones are easier on gathering enough for the recipes. Now, purple adds a presentation plus to the formula. But, cooking makes it all work out. In salsas, I can't tell a difference. I grow the ones that give me the most fruit for my time spent working the plants. Thanks for the link to Adaptive Seeds,and the information on your John Wyche's Tomatillos.I was leaning towards Cisneros,although I did read 1 review stating that it wasn't very productive for the reviewer.It may have been a fluke...who knows? I need to decide on whether to grow the purple or not.I may try just the Cisneros for now,and see how it goes...although,the purple would only be a couple more $. That is very helpful information as well Ted. I had been wondering if there was a significant difference in flavor between varieties that might sway a person in one direction or another.That makes the selection process easier for sure. I grow landrace tomatillos, and notice differences in sweetness between some varieties some of the time. I tend to prefer smaller fruits, about 2 to 4 ounces, because they ripen quicker in my short growing season. I'll let you know how well they grow for us any differences we find in them. If I were in your shoes,I would do the same Joseph.I am lucky tho,to have a long season,so I don't have to add early maturation to the list of varietal considerations. I will look forward to hearing how those work for you.I am still undecided on a Purple (as stated above) but I really do think I would like to give the Cisneros a whirl.I'd like to try the Plaza Latina Giant that Zeedman mentioned...but I will have to give that some thought.It would help if I knew how much I am going to use...and enjoy them. Last edited by Tropicalgrower; April 24, 2016 at 11:42 PM. It would help if I knew how much I am going to use...and enjoy them. That is the reason I have only grown them occasionally. The only thing I use them for is salsa verde... that, and give them away at work. If I knew more good recipes, I might grow them more often... especially since they will be coming up on their own now. I'm trying a purple, I got it from Croatia. purple tomatillo makes an ideal salsa with its sweet tart flavor. I have two growing and it is outpacing everything! It's huge with flowers already. I'm not planting out till Saturday. I have grown ground cherries, but never tomatillo's till now. When looking at pictures, it doesn't look like the purple I see sold around here. I probably have extra seed. Looking for a good green also! I can save ton's of seed too if this is worthwhile? Last edited by drew51; April 26, 2016 at 09:35 PM. I will have to do a search on those drew51.They sound interesting (but don't they all? ),but if I had to order from Croatia,then that would be a little difficult.As has been suggested,just a couple varieties would no doubt serve you very well,at least until you find all the other tasty things you could do with them all. I wonder what recipes the good people of Croatia use these in? I think I would save seed just to be safe,but from what everyone is saying,you won't have a shortage because of the volunteers that will come up year after year. Not only that,but no doubt there are some folks here that would enjoy growing them out as a comparison to the purple varieties that they may already be growing. Please do keep us updated on your new Tomatillos.Very interested to see how they do for you. Last edited by Tropicalgrower; April 26, 2016 at 10:22 PM. I thought about this thread today as I trimmed tomato plants. I was pulling weeds as I was trimming and tying the tomato plants to the horizontal wire/strings. One of the weeds was a volunteer flowering Verde tomatillo plant. It was a very healthy plant, and yet, if left to grow there, it would have been a weed. volunteer flowering Verde tomatillo plant. It was a very healthy plant, and yet, if left to grow there, it would have been a weed. What varieties have you grown thus far Salt?Is that the Grande Rio Verde you are referring too?If so,what is your "take" on that one?Was it pretty productive,and does it produce,a pretty decent sized fruit? It was sold to me as, "Verde", but it probably is Rio Grande Verde. The plant takes up a 3'x3' area easily. It was beyond productive. The fruit size is about what you would see in the grocery store. All the others we are growing are new-to-me. Grocery store tomatillos tastes acidic like a lemon. Home grown tomatillos have a lot more taste profile to them. I can see them as being a lot more than salsa verde. It could also be Toma Verde,but really,what is the difference?If it is productive,and isn't too difficult to process,then it is worthy to grow. I've tried tomatillos 3 times. I have gotten a few purples but it seems like each time,bugs have killed the poor plants just as they were starting to produce. I would recommend growing some of both. The purples are much sweeter so would have different purposes in my mind.